I was on my way out of the house today to take Sam to bassoon lessons when I glanced at the gerbil tanks. 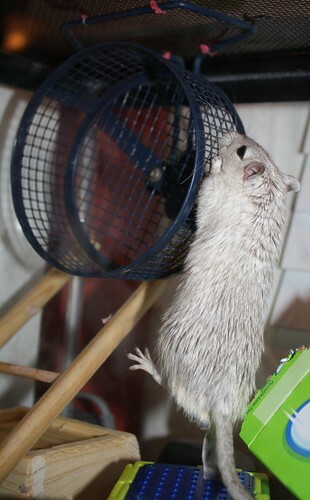 Everything looked fine except I could only see two gerbils in the boy tank, where there are normally three. Mouse was conspicuously absent. Sadly, Mouse hasn't been doing very well as of late. He's been losing weight and has been looking increasingly...rumpled. Mouse was one of the original gerbils and as he was about two and a half years old, I knew he was nearing the end of his lifespan. I asked Alex to check on him as I left, knowing in my heart what I was going to hear. 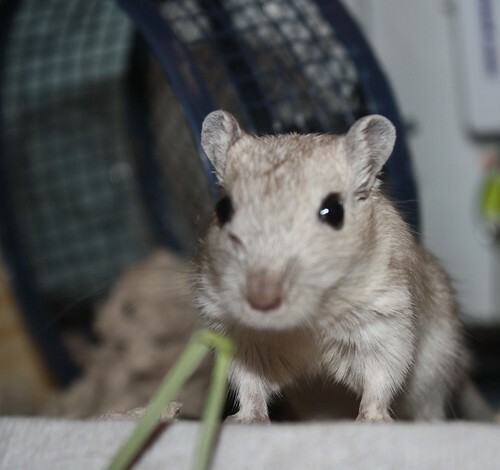 Alex says that the other two gerbils had buried him in the corner, covering him with their bedding. Alex exhumed him from that shallow grave and buried him in our rodent memorial ground (newly established), telling him that he was my favorite (he was) and that we all loved him. This was the first photo I ever posted of Mouse here. May he rest in peace. I've known that this was coming for a while. It was like this with the mice—several months of a slow withering of numbers. 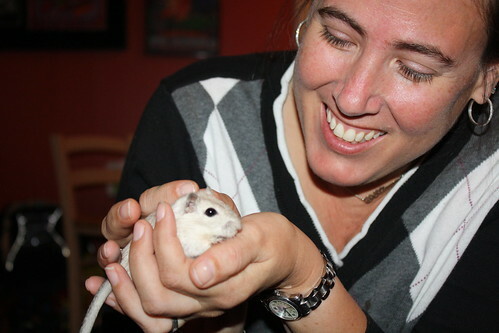 Mouse was the first of what will be a long, sad line of gerbil deaths over the next few months. Poor little guy. I'm going to miss him. Mouse and I bonded quickly. 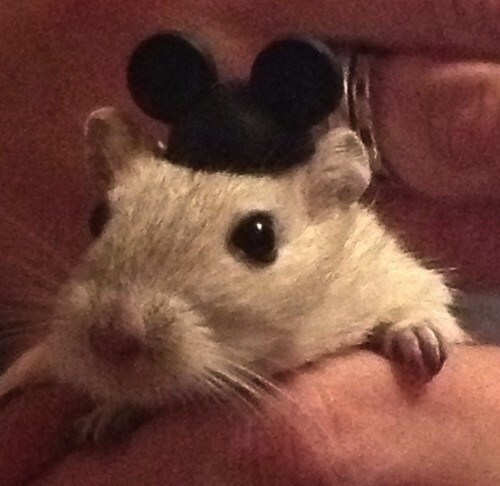 Mouse was always his own gerbil, doing things his own way. 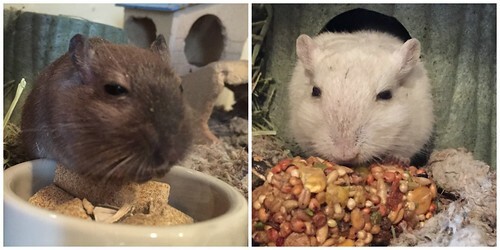 I gave Creeper and King extra seeds and treats after cleaning their tank this afternoon. It was like an, “I’m sorry you had to bury your father” snack. The house seems empty without him. I'm sorry that Mouse is gone. I'm also sorry that King isn't wearing a yarmulke, as I thought at first glance. Aww, I'm sorry. :( RIP little Mouse. That is very sad news. I'm so sorry. The time for little guys like these goes so quickly doesn't it? I'm sorry for your loss. Mouse looked like a very sweet gerbil. It was nice of his cagemates to bury him. Maybe they gave him a little eulogy where they reminisced about him. Oh, I'm sorry. Every time we have a pet die, I wonder if the sadness is worth it. My conclusion is always that it IS, but not when it's Right Afterward. I am so sorry to hear about mouse. OMG, it totally looks like he is. That's hilarious. I know. Pets are the best, but it's SO horrible when you lose them. It does. That's the tough part about rodents—short lives. I seem to remember one was a rare gerbil. Maybe that was Jetpack. I know all about pets dying.